With a diverse landscape abundantly around, rollin hills and a mix of meadow and forest, cultivated and wild, the social landscape also embodied this principle. Oddly enough by including myself, the groups most prominent nationality was ex pat Americans living in Europe for quite sometime. Compliment that with a diverse mix of Europeans as well as an Auzzie and a Chinese bright shiny soul, the borders eroded quickly as guilds formed effortlessly around commonalities rather than random lines and cultural conditioning. Being hosted in Slovakia was a delight for all of us with regional foods rolling out daily as to keep us nourished along the way. And with the brilliant weather we had besides day one and our last day, the gods smiled on us once again to deliver a two week pdc full of fun, learning, adventure and formation. Thus I, Doug Crouch, took on the long and lasting task of delivering the two week PDC facilitation by myself with very limited teaching inputs from our hosts Arvid and Hanna. They helped to host as well as myself to get people accustomed to quite rural living over our two weeks. It was a bi journey and well worth it as the constellation of people that came resulted in one fo the softest groups since the 2009 PDC in Malaysia. It was exactly what i needed as i had only days before arriving finished three straight weeks of teaching at Terra Alta with a teachers training course and a fully attended PDC of two weeks. And because the group was so supportive as well as the greater community f European Volunteer Service folks and volunteers, the course seeminglessly went forward with only minor adjustments here and there as always to adapt to the group and host site context. With that, the real highligt of the course was not just the hands on and class content but a really easy flowing with tremendous output of the design project. We fortunately had quite a few hectares to design and a real design opportunity and the land right out the door of our barn classroom. thus each moment outside of the classroom was time for design observation as where people were camping, our outdoor class spot and just outside of the zone 0 compound were all in very easy access. So I broke the majority of the land into three, all with their challenges and got groups to not only think of their individual group and personal designs but also to work collectively to help form the ecovillage that was an expressed vision by our hosts and clients. So three groups worked through the design projects steps that i have evolved over the years along with others and my own journey as a permaculture designer. But it wasn’t so much about the steps rather the outcome and the tremendous vibe that was a group effort throughout the project. They worked diligently and efficiently to help give information and imagination through the design project to a site that needs some inspiration to take next steps. So each group formed a vision for how they could fit into the greaterr whole and realized some fantastic designs that fit the land and vibe of their group. One of the most amazing parts of each groups design was their ability to realize the principles and also manifest really strong steps of phases of implmentation. They really embodied the need to have small scale intensive systems evolve over time with very logical and well paced stages of evolution. This shows that the students really understood the holistic development model which i expanded upon in this course with the following graphic. My evolution as a teacher continues and i appreciate the good feedback through he design projects to gauge where people are with their learning and also personal journey. Another highlight that happened in week two was getting a chance to bring diversity to the swales that were dug by machinery earlier in the year and had a cover crop grown on them to help prepare for this fall planting. They weren’t built with grace so our shovels and picks, hoes and hands shaped the mounds as we went along planting food forest anchors such as American Persimmon, grafted Paw and Paw and wild plums. 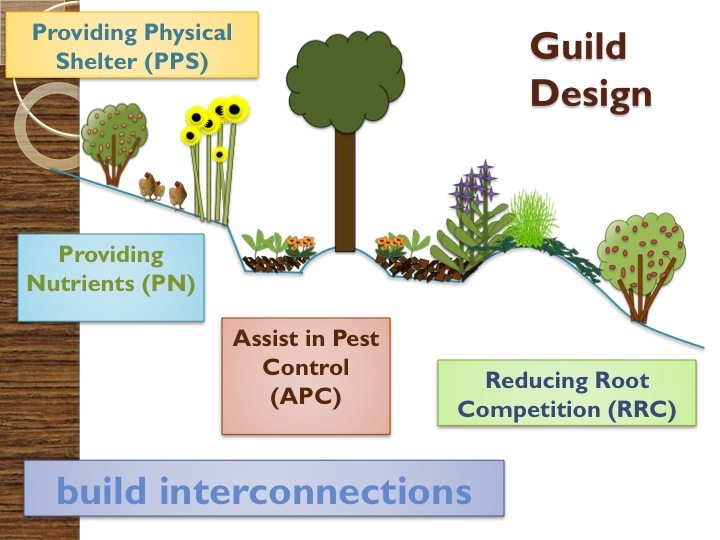 To help form guilds and stack in space and time we added plants like Siberian Pea Shrub, black berries, honeysuckle, mediterranean herbs as well as seeds of all sorts to help stabilize the individual tree terraces and help set the stage for further phases of implementation. We propagated plants on site to help form the guilds and plant them out. We also did fun hands on such as a hot compost pile that was diligently turned throughout the course as time seemed to be slowed down. With that the mornings afforded time to get out there and feel the pile and after the first turn after three days it was turned almost everyday. Even six year old hay proved to be a green material but we had calculated the ratios with it being a brown material. So it made the pile quite hot and needed turned more frequently than usual. Thus we had a successful pile for improving the soils there which need it. It was really apparent with the drought and how the food production came to a grinding halt as a mediterranean like summer came along with the shortages of water and subsequent plant growth. With this added soil input the garden will be more resilient. We also had a nice planning session around contour and swales and decided not to dig them in the moment. it was a nice demonstration and pause instead of just flat out digging. It was a tough summer of teaching for myself with an intense schedule so it also helped me in the moment to recover. We used both the bunyip level and a-frame to measure contour and got the point across well of how to lay out these water harvesting features. It was reinforced by our swale planting where people could see the form. So they missed the part of actually digging it but that is how it goes in pdc’s sometimes. We also had a great sauerkraut session which fit in great with our food at the site. Sauerkraut sandwiches on the amazing sourdough bread with local butter and cheese! add that to the soup of the night and it was great. Was amazing to see the kitchen team cooking with wood only and how they managed in such a hot building. Overall it was a really fun course and we had some great discussions around tours of the site, patterns, and overall missions of life. I really appreciated the softness of this group on the middle leg of my 2015 teaching tour. We had great foods, great field trips, and an overall really supportive atmosphere amongst each other. It was really nice being in eastern Europe as it reminds me of back home a bit and needed that in the moment. More of a deciduous forest, summer time humidity and the normally the color green all summer long. Hopefully next year the rains come. And hopefully i will be going back to teach again.